CRANSTON, R.I. — An historical telephone auction featuring items from two regional chapters of Telephone Pioneers of America Museum — one the William J. Denver chapter #20 museum in Providence, R.I., the other the Excelsior Chapter #98 in Buffalo, N.Y. — was conducted on August 4 by Bruneau & Co Auctioneers. Items pertaining to Alexander Graham Bell, the inventor of the telephone, included an original model of Bell and Thomas A. Watson’s first prototype phone, accompanied by original patent paperwork dated 1881, which quadrupled its high presale estimate to bring $40,000, including premium. 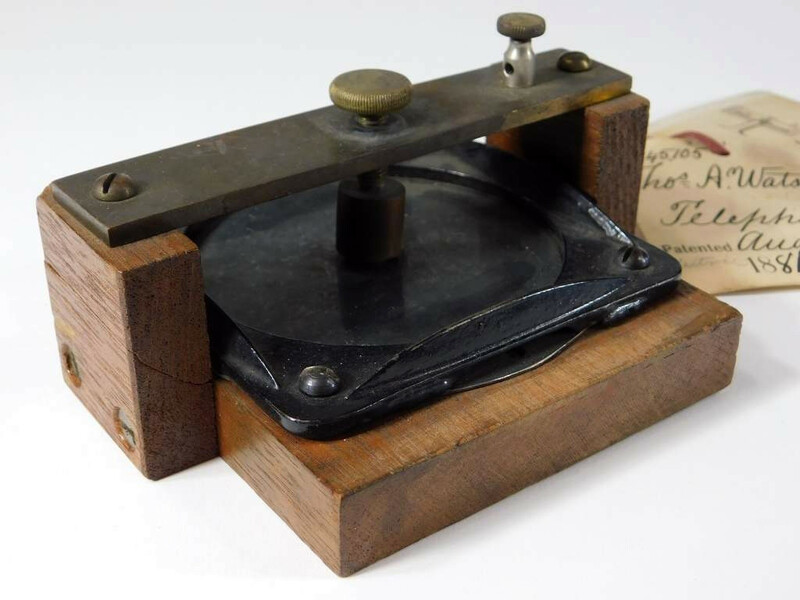 Other Bell-related lots included an early example of the inventor’s butter stamp turned wooden receiver with brass connections, circa 1890, with a magnet occupying the length of the handle. It finished at $27,500, also with premium. Watch for a full report on the sale in an upcoming issue.